Blog — SciGround – Bring learning to life. Interesting story on 7.30 Report recently on screen time. Here's a summary for those who have shortened their attention spans digitally and don’t want to wade to the end of this blog: we don't have enough longitudinal research to know what the appropriate amount of screen time is, those investigations are ongoing. We do know parents are confused and concerned about how much is enough or too much, finding a healthy balance in context is the answer. What was clear in the report was that the modeling of parents in their use of screens was a factor in how children related to their devices. At SciGround, we follow the Digital Nutrition model as prescribed by our screen time guru Jocelyn Brewer - make screen time nutritious AND delicious: each serve has to include a balance of education, activity, fun, collaboration and be layered with other off screen activities and embedded with growth mindset. For those of us who grew up in the 80's and 90's, video games, TV and video were going to be the undoing of society and turn us into zombies. Like most moral panics, it was just a new wave of technology, unknown and unquantified, and in the vacuum of evidence, a plethora of fear drove behavior. Our mobile and screen based world is the new normal. Should we ban screens? We say no. Prohibition is unrealistic as children will be using these tools (and many others we can't even imagine) as a seamless and integrated part of their lives for the rest of their lives. As will we. Demonising an object negates the responsibility of the humans who are administering it. Use the tools with mindfulness and clear guidelines and they will do no more damage than an excess of anything. Of course developing brains shouldn’t be on a device for hours, and of course there are dangers to unlimited access to the full spectrum of the web. But as adults and guides for kids, we are the regulators here, and as Brene Brown says in Dare to Lead, clear is kind - set the rules and then enforce them in a values based way. The kind of courageous leadership she advocates is also courageous parenting. If you're worried about your child and screen time, think about it's context in the rest of their and your lives. Screens are just tools, and we are the human drivers who get to make the choices. If we want to be really brave, lets actually talk about the current models of education and how many children they don’t serve, and have a respectful debate about what the new ways of meaningful learning could look like for engaged, compassionate, agile and connected generations. Harnessing new technologies to grow minds, spark curiousity and develop life long learners - that's what makes us tick. Do you think talent and intelligence something you are born with, or can you literally do anything with hard work, grit and resilience? If you believe that talent and intelligence is something you are born with - and limited by, then you might be rocking a fixed mindset. The good news is that scientific research conducted over 30 years has proven that by changing your mindset, you can achieve in ways you never dreamed of, and cultivating that mindset early leads to greater curiousity and engagement with learning. Let’s begin by understanding more about fixed and growth mindsets, and how to identify what your mindset is. The concept of growth mindset was developed by educational psychologist and Stanford University Professor Carol Dweck, and became popular through her bestselling book Mindset: The New Psychology of Success. Growth mindset research and in class testing over many years by Professor Dweck and her research team has demonstrated a major positive change in children and adults who applied a growth mindset instead of a fixed mindset to their process of learning and skills acquisition. This change was a direct result of being taught how to approach tasks using a mindset that encouraged collaboration, experimentation, effort and failure as integral to the learning journey. Growth Mindset isn’t just learning related. It also has a profound effects on personal relationships, professional success and many other dimensions of life. The greater impacts of growth mindset on creating mentally resilient children is why it is so important to teach them (and parents and teachers) growth mindset thinking as early as possible, and incorporate it in their approach to learning. A mindset, according to Professor Dweck’s definition, is a perception that people hold about themselves and the larger world. Holding the belief that you are intelligent or unintelligent is a simple example of a mindset. People may also have a mindset related to their personal or professional lives, like being good or bad at a task or role. You might say ‘i’m terrible at maths’ or ‘I could never learn a language’ and truly believe that you would never success in these areas. People with a fixed mindset believe that basic personal traits and situations like talent and intellect are permanent states. You either have talent, or you don’t. If, for instance, you believe you are ‘dumb’ at certain things, like math or language learning, you won’t attempt them, and therefore reinforce that belief. Another thing that differentiates these two mindsets the perception and reaction to failure. People with a fixed mindset are more likely to believe that if they fail, all their abilities will be doubted, and that even a small failure is a big problem. We can often see that behaviour in famous sports people or musicians, who once they have achieved success, often have catastrophic personal meltdowns because of the pressure to perform. People with a growth mindset, on the other hand, don’t really see failure as a negative – obstacles are just perceived as opportunities to improve and learn, and by being faced with them and learning something new, we get smarter. With a growth mindset, people believe that effort creates talent, and skills are learned over time, through trial and error. That we are all born with the ability to learn, and that all of us learn at different speeds. The capacity to ‘productively’ fail, where individuals learn from their mistakes and use that learning as a plank of mental growth towards achieving the skill is a key difference in the growth mindset approach. You often see this mindset in famous entrepreneurs - they look at failure as a way to eliminate a less effective method of getting to their goal, and keep on trying until they get there without attachment to what the outcome will be. Along the way, they often invent many new businesses or products as a result of their endeavours which have great value and intellectual property. Strongly underpinning growth mindset is resilience or grit. Learning a new skill takes time and will inevitably involve setbacks all along the way. Resilience and perseverance need to be developed and sustained for this journey, along with the capacity for self reflection and awareness. Students who use a growth mindset approach have been shown to learn more and embrace challenges and failures enthusiastically as opportunities rather than setbacks. Neuroscientists now know that at this age our brains are like sponges and we are able to take on vast amounts of new information. If growth mindset language and practices are incorporated by parents and teachers from birth, children become more resilient, more curious, and see failure as only a small setback on the road to acquiring knowledge, not a reason to stop trying. Teaching growth mindset to children and adults begins with changing the language we use to describe our behaviour. This sounds simple, but can be difficult for adults with a lifetime of neural pathway development relating to ways of thinking. The objective to change the way you praise children is to reframe thoughts from being fixed, to acknowledging the future potential in the situation. Professor Dweck calls this the ‘power of yet’. To illustrate how this works, she tells a story of a school where when students failed a test, the grade on their paper wouldn’t say ‘fail’ it would say ‘not yet.’ Saying you are not ready yet to students instead of saying they failed a class is a much better way to show them that even if they have difficulties now, they will succeed eventually if they keep trying. The use of ‘yet’ shows that the learning is ongoing, and that it is the process of learning where the success happens, not the outcome. This also tells children that they aren’t being taught to learn simply to achieve a test score or a high grade, but for their long term future. It encourages them to dream big, and that learning new skills takes time and patience, and therefore that whatever they want to achieve as adults can be reached - even if it seems impossible now. Growth mindset also strongly encourages learning that happens collectively. Where children work together, and solve problems together, they learn from example different approaches, that all of us are smarter than one of us. Especially for young learners, this also encourages sharing, listening, critical thinking and discussions and a social approach to learning, which has long term benefits to collaborations at higher levels of education, university and in the workplace with teams. Understanding the power of growth mindset is a secret weapon in a teacher and parent’s toolkit, especially if it is used as a young learner in the classroom and at home. Allowing children to struggle and encouraging their own discovery rather than jumping in and helping really helps children to become resilient and capable of solving problems. Children need to be encouraged to not try easy tasks so they don’t make mistakes, as mistakes are a critical part of learning. It is the mistakes that grow the brain by firing neurons and making the new connections that result in knowledge. Growth mindset methodology isn’t just for teaching kids. As parents and teachers our fixed mindsets also can limit our self belief and how we model behavior in our families and relationships. By using growth mindset language as part of the ecosystem of educating children in all the contexts of their lives, we are also helping ourselves achieve – as growth mindset teachers us, it’s never too late to adopt a growth mindset. Failure and making mistakes are the scaffolding for learning in growth mindset with the true reward that children will develop a lifelong love of learning, the skills to adapt to any situation, curiosity and most of all a sense of courage so they seek fun, success and adventure for life through hard work and self awareness. Growth mindset gives children the capacity for lifelong learning. They can adapt to a fast changing world, and know that new knowledge and skills are available to everyone who keeps trying and learning. There is no limit to their capacity to achieve with a growth mindset. The children of today will work in jobs that we never dreamed of, raise the standard of living for whole communities, and their early education at home and in the classroom are what will prepare them for their exciting future. It’s a hot debate, and one that is fiercely contested across the spectrum of parents and teachers. But how much screen time is enough? 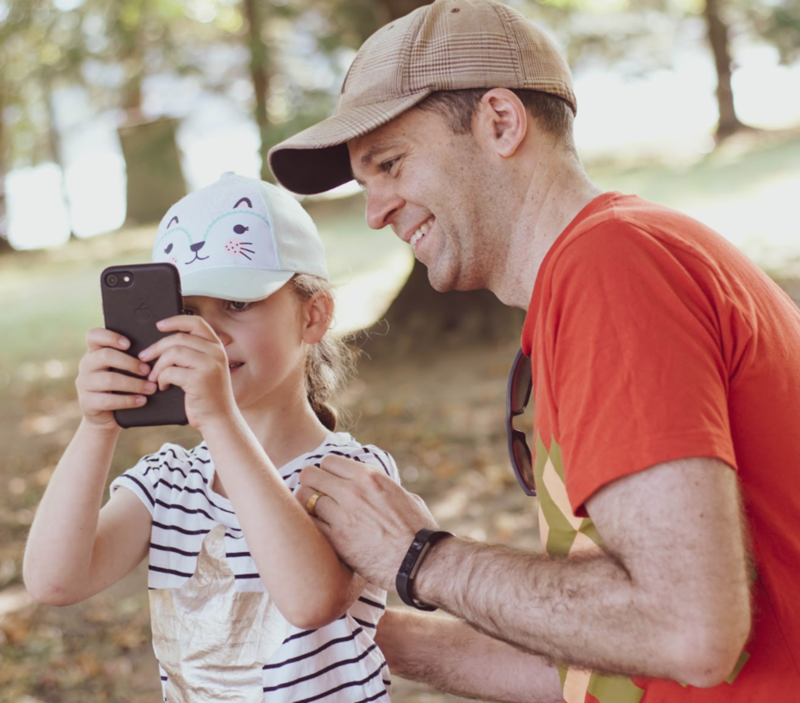 We asked Jocelyn Brewer, child psychologist and founder of cyber psychology consultancy Digital Nutrition what she thought about kids and screen time. Jocelyn spends much of her time working with parents and teachers to help them understand the research on the impacts of screentime, and she likens it to the digital equivalent to the food pyramid - when the inputs to your child are in balance, then screen time is a healthy part of that mix. Jocelyn isn’t a fan of prohibition, instead suggests an open and healthy dialogue with families about screen use. The reality is that kids like playing using a combination of digital and IRL situations. When you can integrate play, and outdoors and leaning together, the impacts of each are amplified rather than diminished. What does your families digital health look like - make a fun table of all your online and offline activities and see if it is in balance or needs a little tweaking! Guided Play Embeds the Learning and the Fun! Monkeys play. Dogs play. Rats play. Even octopuses play. And without any prompting, children in all cultures of the world, invent and reinvent play in every generation using the tools and technology available to them. Decades of research suggest that play is integral to evolution and development in humans and their animal pals. In particular, free play and guided play— known as playful learning—are tools through which children can learn in joyful and conceptually rich ways, ways that help this learning to stick and be scaffolded to learn and try new things. A growing body of behavioral research establishes relationships between children’s play and development in several areas, including language executive functions, mathematics and spatial skills, scientific thinking, and social and emotional development. One reason that play might be such a valuable pedagogical tool is that it features the precise contexts that facilitate learning. An amalgamated research field called the science of learning has identified four key ingredients of successful learning: learning occurs best when children are mentally active (not passive), engaged (not distracted), socially interactive (with peers or adults), and building meaningful connections to their lives. SciGround uses this research to underpin how we design our guided STEM play, as we believe that when children are having fun, exploring and being challenged, this is where the best learning happens.